The Great Lakes–which provide drinking water for nearly 40 million people, including more than a million Wisconsinites–are at risk. Gathering Waters staff is in D.C. this week for Great Lakes Day with more than 100 advocates from the region to let members of Congress know how vital and valuable the Great Lakes are to our state’s economy and quality of life. Executive Director, Mike Carlson and Government Relations Director, Chris Danou were in Senator Baldwin’s office on the morning the draft budget was released. Wisconsin land trusts and the Great Lakes. 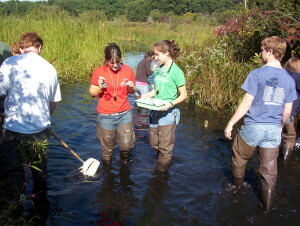 The Great Lakes Restoration Initiative is a critical federal program for cleaning up toxic pollution, reducing polluted runoff, controlling invasive species and restoring habitat. Cuts to this funding would be devastating. The Trump Administration’s preliminary budget eviscerates funding for the Great Lakes Restoration Initiative (GLRI)–a critical federal program for cleaning up toxic pollution, reducing polluted runoff, controlling invasive species and restoring habitat. 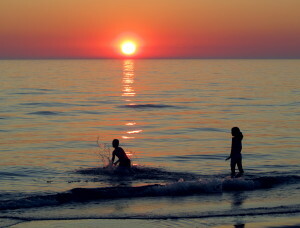 The loss of the $300 million annual funding would devastate Great Lakes restoration efforts. The GLRI has enjoyed strong bi-partisan support in Congress, and we’re looking to Wisconsin’s Congressional delegation for leadership in defending critical Great Lakes funding and programs. Read a statement from the Healing Our Waters Coalition to find out more about the immediate threat to one of Wisconsin’s most valuable assets. You can help by contacting legislators and making a donation. 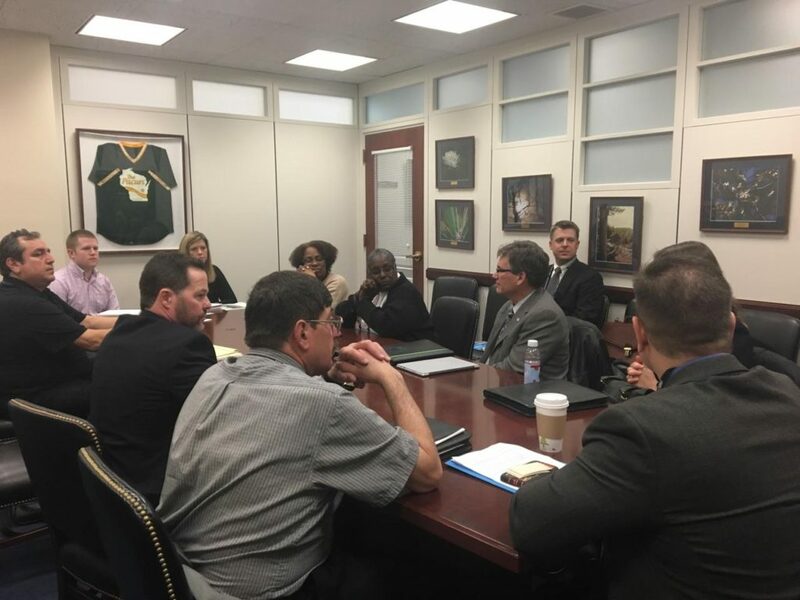 As part of the HOW Coalition’s annual fly-in to Washington DC, more than 100 Great Lakes advocates, including Gathering Waters staff, are meeting with members of Congress this week to talk about successful restoration efforts and the need for continued investment in the region. Can’t join us in DC? No problem–you can make a difference from home. Call your federal representatives today and ask them to protect critical Great Lakes funding and programs. Find contact information for Wisconsin’s U.S. Senators and your U.S. House member, or simply text your zip code to 520-200-2223. You’ll get a text back immediately with everything you need. Also, consider a donation to Gathering Waters today to increase your impact. More than a dozen Wisconsin land trusts help protect the Great Lakes in the Lake Michigan and Lake Superior basins through land protection and management. 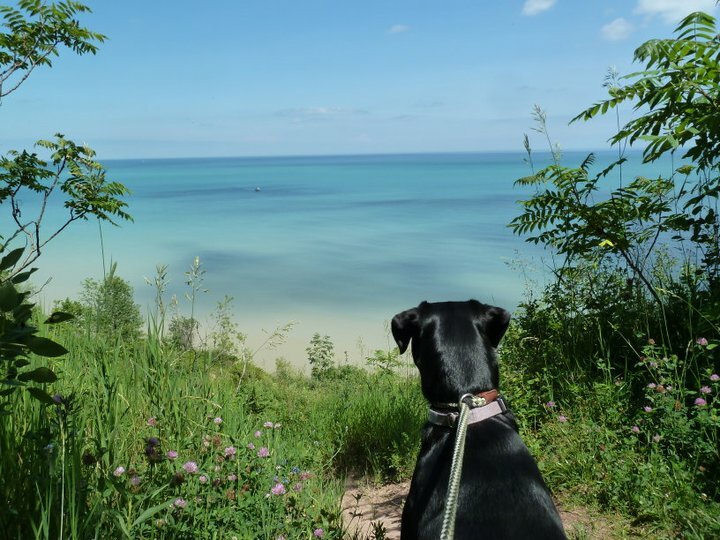 More than a dozen Wisconsin land trusts help protect the Great Lakes in the Lake Michigan and Lake Superior basins through land protection and management. These protected lands–such as the Frog Bay Tribal National Park–also provide access to the Lakes for all of us–for all kinds of recreation and enjoyment, forever. Cuts to the Great Lakes Restoration Initiative would be devastating to these efforts in the region. The following is a statement from the Healing Our Waters-Great Lakes Coalition (HOW Coalition), which consists of more than 145 environmental, conservation, outdoor recreation organizations, zoos, aquariums and museums representing millions of people, whose common goal is to restore and protect the Great Lakes. Gathering Waters is a proud part of the HOW Coalition. ANN ARBOR, MICH. (March 9, 2017)—The Healing Our Waters-Great Lakes Coalition today expressed deep concern with the rumored Trump Administration’s budget cuts that would gut core Great Lakes programs, roll back Clean Water Act protections, and delay federal action to respond to serious threats like the invasive Asian carp. Absent a change in course from the Trump Administration, the Coalition is looking to work with the U.S. Congress to keep federal restoration efforts on track. Preliminary Trump Administration budget numbers leaked last week would eviscerate funding for the Great Lakes Restoration Initiative – the popular and successful federal program to clean up toxic pollution, reduce runoff, control invasive species and restore habitat – from $300 million to $10 million, a 97 percent cut. This cut comes, even though President Trump’s campaign pledged to support Great Lakes restoration investments in September 2016. In addition to cuts to Great Lakes programs, the budget also contained drastic cuts to other critical programs and even the elimination of programs such as the EPA’s environmental justice office. Issued an executive order asking federal agencies to review the Clean Water Rule to determine whether to revise or rescind it. President Trump is scheduled to release the final proposed budget the week of March 13. 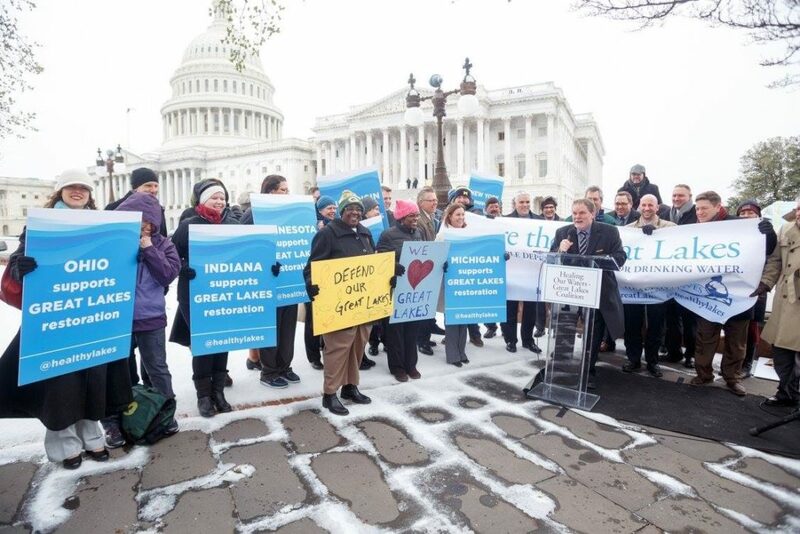 That week, as part of the Healing Our Waters-Great Lakes Coalition’s annual fly-in to Washington, D.C., more than 100 Great Lakes advocates will be meeting with members of Congress to talk about successful restoration efforts. Over the past three years, Republicans and Democrats in the U.S. Congress have beaten back attempts to cut Great Lakes programs. Learn more about the Healing Our Waters-Great Lakes Coalition at www.healthylakes.org or follow us on Twitter @healthylakes. Hopefully your 2014 is off to an excellent start…. We at Gathering Waters are definitely looking forward to all that this new year has to offer— we’re launching our new and improved three-year strategic plan and it’s our 20th anniversary! Education, education, education! With the state budget coming up a year from now and the Gubernatorial election set for this fall, we’ll be working hard to make sure legislators know exactly how important it is that the Knowles Nelson Stewardship Program remains strong and that the Gubernatorial candidates are keenly aware of the important role land conservation and land trusts play in their communities. Partnerships. The Healing Our Waters – Great Lakes Coalition is accomplishing such great things, we’ll definitely continue working with them to ensure that local, state and federal officials continue to make Great Lakes restoration a priority. We’ll be working hard to ensure the best interests of our land trusts are being represented in the political arena. Staying true. True to our core objective that is- to strengthen Wisconsin’s land trusts, ensuring that they have the resources, tools, and know-how to meet community needs and protect the places that make Wisconsin so special. At their service. Since it’s proven to be so valuable to land trusts, we’ll definitely continue our Land Trust Excellence & Advancement Program, offering trainings that have been customized to land trusts’ needs. More partnerships. We will we bring land trusts together to create efficiencies through shared staff, pooled resources, and joint funding opportunities. We’ll also continue our work with the Lake Michigan Shorelands Alliance to help identify, protect, restore and manage lands that protect the water quality, wildlife habitats, and the scenic integrity of Wisconsin’s Lake Michigan Basin. Retreat! Our annual Land Trust Retreat this October will offer an unparalleled opportunity for learning, networking, and fun among land trust peers and conservation experts from around the state. We’ll be doing all we can to ensure our land trusts have what they need, to meet community needs and protect the places that make Wisconsin special. Turn up the volume. You may not realize the extent of the value your local land trust brings to you and your loved ones. We’re going to do a better job of making sure you know. Put it in writing. This fall, in honor of the twenty years we have been working to strengthen land trusts, we will be publishing a collection of stories, highlighting the many ways land trusts benefit Wisconsin’s collective health, economy and education. Let’s Party! 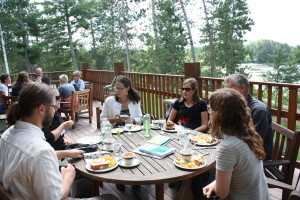 Our annual Land Conservation Leadership Awards Celebration is happening September 26th. 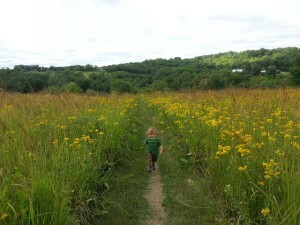 It’s definitely the place to be if you’re interested in Wisconsin land conservation. And on May 3rd, we’ll be honoring you and others who make it possible for us to continue Wisconsin’s incredible land legacy, at our annual Land Legacy Gathering. Better save the dates and grab your party shoes. We’ll be spreading the word of our land trusts’ successes and of the countless opportunities and benefits they provide. As you can see, it’s going to be an incredible, busy year. We’re looking forward to it and appreciate all of the feedback and help we can get. Feel free to shoot us an email with your thoughts or support the work we’re doing with a tax-deductible gift. Cheers, to this wonderful new year! Last Monday, January 13, the US Congress released its 2014 spending bill. It was a victory for the Great Lakes, as the bill restores funding to two essential Great Lakes programs. It provides $300 million for the Great Lakes Restoration Initiative and $1.44 billion for The Clean Water State Revolving Fund, for fiscal year 2014. As a partner of the Healing Our Waters – Great Lakes Coalition (HOW), we work hard to ensure that local, state and federal officials continue to make Great Lakes restoration a priority. So, this was a victory for us as well! Why do we care? Because the importance of the Great Lakes cannot be over emphasized. As the HOW website points out, the Great Lakes provide drinking water to more than 30 million people. More than 1.5 million U.S. jobs are directly connected to the Great Lakes, generating $62 billion in wages annually. Every $1 investment in Great Lakes restoration generates at least $2 of economic benefit. How does this renewed funding help? The Great Lakes Restoration Initiative supports efforts to clean up toxic pollution, restore fish and wildlife habitat, fight invasive species, and reduce runoff from cities and farms. The Clean Water State Revolving Fund provides low-interest loans to communities across the nation to fund water quality protection projects for wastewater treatment, nonpoint source pollution control, and watershed and estuary management. The Great Lakes are important to us all. In early August, we had two exciting opportunities to highlight the important work that Wisconsin land trusts are doing for Great Lakes restoration and protection in both the Lake Superior and Lake Michigan basins. On August 6, GWC Government Relations Director, Mike Carlson, joined GWC Board members, Tia Nelson and Ellen Kwiatkowski, for a tour of the Frog Bay Tribal National Park with Congressman Sean Duffy. 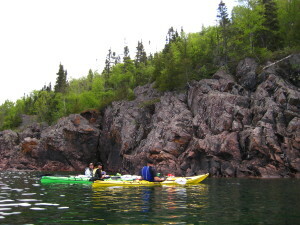 The Frog Bay project, which protects over a ¼ mile of Lake Superior shoreline, involved a partnership between the Bayfield Regional Conservancy and the Red Cliff Tribe and utilized federal funding through the Coastal and Estuarine Land Conservation Program (CELCP). Congressman Duffy has demonstrated leadership by assuming the role as Co-Chair of the Great Lakes Task Force with the Northeast-Midwest Institute, and this tour provided an important opportunity to show the value of programs like CELCP and the Great Lakes Restoration Initiative (GLRI), as well as the important role that land trusts can play in permanently protecting critical parcels along the Great Lakes. It was a beautiful day on the shore of Lake Superior overlooking the Apostle Islands! GWC board members Tia Nelson and Ellen Kwiatkowski tour Frog Bay Tribal National Park with Congressman Duffy and Chad Abel with the Red Cliff Tribe. 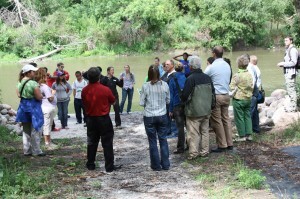 On August 10, we hosted the Great Lakes Restoration Tour: Milwaukee Area Successes. 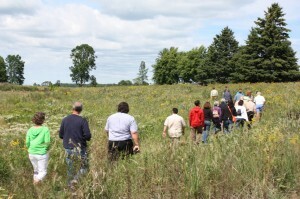 This tour was organized in partnership with the Healing our Waters Coalition (HOW), the River Revitalization Foundation (RRF), the Urban Ecology Center (UEC), and Ozaukee Washington Land Trust (OWLT) and emphasized significant conservation sites in southeast Wisconsin. These sites highlighted progress, as well as ongoing needs and opportunities, in Great Lakes protection and restoration. The Milwaukee sites included the Milwaukee Rotary Centennial Arboretum, which is a GLRI restoration project adjacent to the UEC and Riverside Park, and RRF’s Wheelhouse parcel, which is a restoration of a blighted site in the Milwaukee River Area of Concern into a riverfront park. Both sites sit along the Milwaukee River and are part of the 800 acre Milwaukee River Greenway. During the morning we heard from representatives from HOW, Rotary Club of Milwaukee, the Southeast Wisconsin Watersheds Trust, UEC, RRF, and the Conservation Fund. 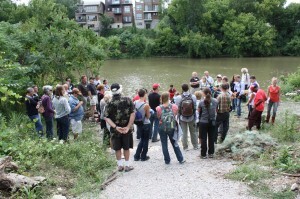 Tour participants stand on the bank of the Milwaukee River and hear about the surrounding restoration work spearheaded by the Urban Ecology Center. Just a mile down the River, and mile from where the River flows into Lake Michigan, tour participants visit the River Revitalization Foundation’s Wheelhouse property and hear about their restoration efforts and work to grant public access to the River. In the afternoon, we visited the OWLT’s Forest Beach Migratory Preserve — a unique 116-acre site that was previously used as a golf course. The land trust is transforming the property into a major migratory bird stopover site and using GLRI funding to research bird and bat migratory patterns to determine the importance of stopover habitat along the Lake Michigan Migratory Flyway. During the afternoon session, we heard from representatives from OWLT, the Western Great Lakes Bird and Bat Observatory, and Ozaukee County. Bill Mueller of the Western Great Lakes Bird and Bat Observatory speak to tour participants at Ozaukee Washington Land Trust’s Forest Beach Migratory Preserve. 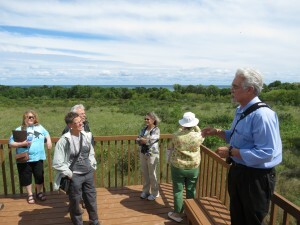 Tour participants enjoy a hike through the Forest Beach Migratory Preserve. Tour attendees included community leaders from the Milwaukee and Ozaukee area; government officials from WI DNR and the Wisconsin Coastal Management Program; the Policy Director for the Healing Our Waters Coalition, Chad Lord; and many others. In total, more than 60 people joined us for the day. We were thrilled that Congresswoman Gwen Moore and Milwaukee County Executive Chris Abele agreed to participate in the tour and provide remarks, as they have both been long-time supporters of Great Lakes restoration. Unfortunately, at the last minute, they both needed to attend the memorial service for the victims of the tragic Oak Creek shooting. We missed them at the event, but appreciate their commitment to Great Lakes issues. It was a great day, and we lucked out with near perfect weather! Not only are we fortunate as Wisconsinites to have access to two of the Great Lakes, but we also bear the responsibility of ensuring their long-term health and viability as a valuable natural resource. Land trusts play a significant role in the protection of the Great Lakes through the preservation and restoration of adjacent lands. On August 10th, Gathering Waters Conservancy is teaming up with our partners at the Healing Our Waters Coalition, the Urban Ecology Center, the River Revitalization Foundation, and Ozaukee Washington Land Trust to host a tour of innovative conservation projects in the Milwaukee area that highlight progress, as well as ongoing needs and opportunities, in Great Lakes protection and restoration, with a particular focus on the economic and ecological benefits of the Great Lakes Restoration Initiative. A view of urban land conservation along the Milwaukee River — a mile from downtown Milwaukee — which flows into Lake Michigan. Attendees will have the opportunity to hear from land trust, elected, civic, and agency leaders who are at the center of the effort to restore the Great Lakes through Milwaukee-area land protection. The day-long tour is open to the public. Transportation between sites and lunch will be provided. We hope you make plans to join us! RSVP on-line by August 6th.